"Ortsteil" redirects here. For subdistricts of Berlin, see Boroughs and neighborhoods of Berlin. For other uses, see Village (disambiguation). A village is a clustered human settlement or community, larger than a hamlet but smaller than a town, with a population ranging from a few hundred to a few thousand. Though villages are often located in rural areas, the term urban village is also applied to certain urban neighborhoods. Villages are normally permanent, with fixed dwellings; however, transient villages can occur. Further, the dwellings of a village are fairly close to one another, not scattered broadly over the landscape, as a dispersed settlement. In the past, villages were a usual form of community for societies that practice subsistence agriculture, and also for some non-agricultural societies. In Great Britain, a hamlet earned the right to be called a village when it built a church. In many cultures, towns and cities were few, with only a small proportion of the population living in them. The Industrial Revolution attracted people in larger numbers to work in mills and factories; the concentration of people caused many villages to grow into towns and cities. This also enabled specialization of labor and crafts, and development of many trades. The trend of urbanization continues, though not always in connection with industrialization. Although many patterns of village life have existed, the typical village is often small, consisting of perhaps 5 to 30 families. Historically homes were situated together for sociability and defence, and land surrounding the living quarters was farmed. Traditional fishing villages were based on artisan fishing and located adjacent to fishing grounds. "The soul of India lives in its villages," declared M. K. Gandhi at the beginning of 20th century. According to the 2011 census of India, 68.84% of Indians (around 833.1 million people) live in 640,867 different villages. The size of these villages varies considerably. 236,004 Indian villages have a population of fewer than 500, while 3,976 villages have a population of 10,000+. Most of the villages have their own temple, mosque, or church, depending on the local religious following. In Afghanistan, the village, or deh (Dari/Pashto: ده) is the mid-size settlement type in Afghan society, trumping the hamlet or qala (Dari: قلعه, Pashto: کلي), though smaller than the town, or shār (Dari: شهر, Pashto: ښار). In contrast to the qala, the deh is generally a bigger settlement which includes a commercial area, while the yet larger shār includes governmental buildings and services such as schools of higher education, basic health care, police stations etc. Auyl (Kazakh: Ауыл) is a Kazakh word meaning "village" in Kazakhstan. According to the 2009 census of Kazakhstan, 42.7% of Kazakhs (7.5 million people) live in 8172 different villages. To refer to this concept along with the word "auyl" often used the Slavic word "selo" in Northern Kazakhstan. In mainland China, villages 村 are divisions under township Zh:乡 or town Zh:镇. In the Republic of China (Taiwan), villages are divisions under townships or county-controlled cities. The village is called a tsuen or cūn (村) under a rural township (鄉) and a li (里) under an urban township (鎮) or a county-controlled city. See also Li (unit). In Brunei, villages are officially the third- and lowest-level subdivisions of Brunei below districts and mukims. A village is locally known by the Malay word kampung (also spelt as kampong). They may be villages in the traditional or anthropological sense but may also comprise delineated residential settlements, both rural and urban. The community of a village is headed by a village head (Malay: ketua kampung). Communal infrastructure for the villagers may include a primary school, a religious school providing ugama or Islamic religious primary education which is compulsory for the Muslim pupils in the country, a mosque, and a community centre (Malay: balai raya or dewan kemasyarakatan). Selo (Cyrillic: село; Polish: sioło) is a Slavic word meaning "village" in Bosnia and Herzegovina, Bulgaria, Croatia, North Macedonia, Russia, Serbia, and Ukraine. For example, there are numerous sela (plural of selo) called Novo Selo in Bulgaria, Croatia, Montenegro and others in Serbia, and North Macedonia. 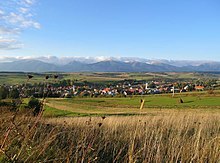 Another Slavic word for a village is ves (Polish: wieś, wioska, Czech: ves, vesnice, Slovak: ves, Slovene: vas, Russian: весь). In Slovenia, the word selo is used for very small villages (fewer than 100 people) and in dialects; the Slovene word vas is used all over Slovenia. In Russia, the word ves is archaic, but remains in idioms and locality names, such as Vesyegonsk. 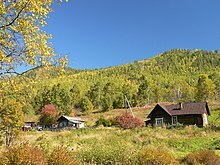 In Russia, as of the 2010 Census, 26.3% of the country's population lives in rural localities; down from 26.7% recorded in the 2002 Census. 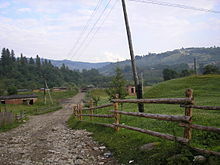 Multiple types of rural localities exist, but the two most common are derevnya (деревня) and selo (село). Historically, the formal indication of status was religious: a city (gorod, город) had a cathedral, a selo had a church, while a derevnya had neither. The historically Cossack regions of Southern Russia and parts of Ukraine, with their fertile soil and absence of serfdom, had a rather different pattern of settlement from central and northern Russia. While peasants of central Russia lived in a village around the lord's manor, a Cossack family often lived on its own farm, called khutor. A number of such khutors plus a central village made up the administrative unit with a center in a stanitsa (Russian: стани́ца; Ukrainian: станиця, stanytsia). Such stanitsas often with a few thousand residents, were usually larger than a typical selo in central Russia. 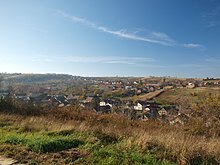 In Ukraine, a village, known locally as a selo (село), is considered the lowest administrative unit. Villages may have an individual administration (silrada) or a joint administration, combining two or more villages. Villages may also be under the jurisdiction of a city council (miskrada) or town council (selyshchna rada) administration. Saint-Cirq-Lapopie in Lot is one of "The Most Beautiful Villages in France". A commune is considered as a village if it is not part of a ville (urban unit). For the Insee, an urban unit has more than 2000 inhabitants living in buildings less than 200 metres from each others. An independent association named Les Plus Beaux Villages de France, was created in 1982 to promote assets of small and picturesque French villages of quality heritage. 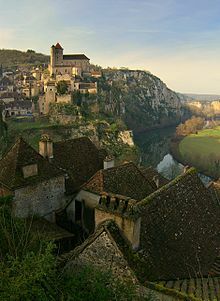 As of 2008, 152 villages in France have been listed in "The Most Beautiful Villages of France". In Italy, villages are spread throughout the country. No legal definition of village exists in Italian law; nonetheless, a settlement inhabited by less than 2000 people is usually described as "village". More often, Italian villages that are a part of a municipality are called frazione, whereas the village that hosts the municipal seat is called paese (town) or capoluogo. In the flood-prone districts of the Netherlands, particularly in the northern provinces of Friesland and Groningen, villages were traditionally built on low man-made hills called terpen before the introduction of regional dyke-systems. In modern days, the term dorp (lit. "village") is usually applied to settlements no larger than 20,000, though there's no official law regarding status of settlements in the Netherlands. A village in the UK is a compact settlement of houses, smaller in size than a town, and generally based on agriculture or, in some areas, mining (such as Ouston, County Durham), quarrying or sea fishing. They are very similar to those in Ireland. The major factors in the type of settlement are: location of water sources, organisation of agriculture and landholding, and likelihood of flooding. For example, in areas such as the Lincolnshire Wolds, the villages are often found along the spring line halfway down the hillsides, and originate as spring line settlements, with the original open field systems around the village. In northern Scotland, most villages are planned to a grid pattern located on or close to major roads, whereas in areas such as the Forest of Arden, woodland clearances produced small hamlets around village greens. Because of the topography of the Clent Hills the north Worcestershire village of Clent is an example of a village with no centre but instead consists of series of hamlets scattered on and around the Hills. 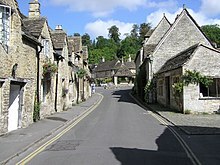 For many British people, the village represents an ideal of Great Britain. Seen as being far from the bustle of modern life, it is represented as quiet and harmonious, if a little inward-looking. This concept of an unspoilt Arcadia is present in many popular representations of the village such as the radio serial The Archers or the best kept village competitions. Many villages in South Yorkshire, North Nottinghamshire, North East Derbyshire, County Durham, South Wales and Northumberland are known as pit villages. These (such as Murton, County Durham) grew from hamlets when the sinking of a colliery in the early 20th century resulted in a rapid growth in their population and the colliery owners built new housing, shops, pubs and churches. Some pit villages outgrew nearby towns by area and population; for example, Rossington in South Yorkshire came to have over four times more people than the nearby town of Bawtry. Some pit villages grew to become towns; for example, Maltby in South Yorkshire grew from 600 people in the 19th century to over 17,000 in 2007. Maltby was constructed under the auspices of the Sheepbridge Coal and Iron Company and included ample open spaces and provision for gardens. If a village is the principal settlement of a civil parish, then any administrative body that administers it at parish level should be called a parish council or parish meeting, and not a town council or city council. However, some civil parishes have no functioning parish, town, or city council nor a functioning parish meeting. In Wales, where the equivalent of an English civil parish is called a Community, the body that administers it is called a Community Council. However, larger councils may elect to call themselves town councils. In Scotland, the equivalent is also a community council, however, despite being statutory bodies they have no executive powers. Pacific Islands Communities on Pacific islands were historically called villages by English speakers who traveled and settled in the area. Some communities such as several Villages of Guam continue to be called villages despite having large populations that can exceed 40,000 residents. New Zealand The traditional Māori village was the pā, a fortified hill-top settlement. Tree-fern logs and flax were the main building materials. As in Australia (see below) the term is now used mainly in respect of shopping or other planned areas. Australia The term village often is used in reference to small planned communities such as retirement communities or shopping districts, and tourist areas such as ski resorts. Small rural communities are usually known as townships. Larger settlements are known as towns. Argentina Usually set in remote mountainous areas, some also cater to winter sports or tourism. See Uspallata, La Cumbrecita, Villa Traful and La Cumbre. There is no population limit to villages in New York. Hempstead, the largest village, has 55,000 residents; making it more populous than some of the state's cities. However; villages in the state may not exceed five square miles (13 km²) in area. Michigan and Illinois also have no set population limit for villages and there are many villages that are larger than cities in those states. The village of Arlington Heights, Illinois had 75,101 residents as of the 2010 census. In North Carolina, the only difference between cities, towns, and villages is the term itself. In states that have New England towns, a "village" is a center of population or trade, including the town center, in an otherwise sparsely developed town or city — for instance, the village of Hyannis in the town of Barnstable, Massachusetts. In the North, villages were under traditional rulers long before the Jihad of Shaikh Uthman Bin Fodio and after the Holy War. At that time Traditional rulers used to have absolute power in their administrative regions. After Dan Fodio's Jihad in 1804, political structure of the North became Islamic where emirs were the political, administrative and spiritual leaders of their people. These emirs appointed a number of people to assist them in running the administration and that included villages. ^ "Indian Census". Censusindia.gov.in. Archived from the original on 14 May 2007. Retrieved 9 April 2012. ^ "A dictionary of the Puk'hto, Pus'hto, or language of the Afghans". dsalsrv02.uchicago.edu. Retrieved 4 May 2018. ^ "Archived copy". Archived from the original on 13 November 2013. Retrieved 14 March 2014. CS1 maint: Archived copy as title (link). ^ a b "Tutong District" (PDF). www.information.gov.bn. pp. 7–9. Retrieved 1 March 2018. ^ "Region2-city | Brunei Postcode". brn.postcodebase.com. Retrieved 1 March 2018. ^ "Brunei will remain a MIB-guided nation, thanks to religious education | Borneo Bulletin Online". borneobulletin.com.bn. Retrieved 1 March 2018. ^ "Merriam-Webster Online". M-w.com. 25 April 2007. Retrieved 28 March 2010. ^ Geertz, Clifford. "Local Knowledge: Fact and Law in Comparative Perspective", pp. 167–234 in Geertz Local Knowledge: Further Essays in Interpretive Anthropology, NY: Basic Books. 1983. ^ a b c "Human Settlement Country Profile, Bulgaria (2004)" (PDF). United Nations Department of Economic and Social Affairs. Retrieved 30 November 2008. ^ (in French) Ville - definition on the insee.fr site. ^ Wild, Martin Trevor (2004). Village England: A Social History of the Countryside. I.B.Tauris. p. 12. ISBN 978-1-86064-939-4. ^ Taylor, Christopher (1984). Village and farmstead: A History of Rural Settlement in England. G. Philip. p. 192. ISBN 978-0-540-01082-0. ^ OECD (2011). OECD Rural Policy Reviews: England, United Kingdom 2011. OECD Publishing. p. 237. ISBN 9264094423. ^ The Parliamentary gazetteer of England and Wales. 3. A. Fullarton & Co. 1851. p. 344. ^ "Maltby Ward". Rotherham Metropolitan Borough Council. Archived from the original on 21 March 2012. Retrieved 26 June 2011. ^ Baylies, Carolyn Louise (1993). The history of the Yorkshire miners, 1881–1918. Routledge. ISBN 0415093597. ^ "National Statistics". Statistics.gov.uk. Archived from the original on 13 March 2010. Retrieved 28 March 2010. ^ "Portobello Community Council". Porty.org.uk. Archived from the original on 4 March 2012. Retrieved 28 March 2010. ^ "Ouston Parish Council". durham.gov.uk. ^ "A project proposal". Almashriq.hiof.no. Retrieved 28 March 2010. ^ "Village". Websters-online-dictionary.org. Retrieved 28 March 2010. ^ "Detailed map of Ohio" (PDF). United States Census Bureau. 2000. Retrieved 28 March 2010. ^ "Ohio Revised Code Section 703.01(A)". Retrieved 28 March 2010. ^ Adesiyun, A. A.; Adekeye, J. O.; Umoh, J. U.; Nadarajab, M. (1983). "Studies on well water and possible health risks in Katsina, Nigeria". The Journal of hygiene. 90 (2): 199–205. doi:10.1017/S0022172400028862. PMC 2134251. PMID 6833745. ^ How Katsina state is doing so much with so little. abrahamplace.blogspot.jp (29 October 2012; original from peoplesdaily-online.com). ^ Nigerian Operator Expands Coverage. cellular-news.com (5 April 2006). Wikimedia Commons has media related to Villages. 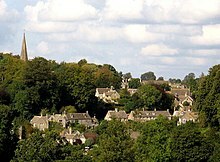 Look up village in Wiktionary, the free dictionary. "Village Communities" . Encyclopædia Britannica (11th ed.). 1911.